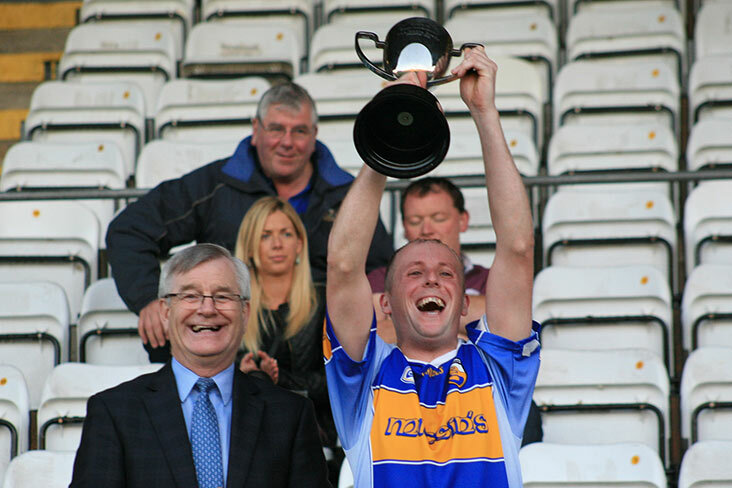 Mullahoran captain Ronan O'Hagan lifts the Cavan SHC trophy with county board chairman Gerry Brady. It was one-way traffic at Kingspan Breffni where Mullahoran outclassed holders Cootehill to claim their first Cavan SHC title in four years. The writing was on the wall for Cootehill when Michael Carr netted in the fourth minute. Carr raised a second green flag in the 17th minute to help the winners to a 2-9 to 0-2 interval lead. Further majors from Philip Brady and Adam Mulcahy in the second half wrapped up a facile win for St. Joseph's, who will now face Naomh Colmcille of Tyrone in the first round of the Ulster JHC. Mullahoran - D Sheridan; S Og Brady, C O'Brien, A Sheridan (0-1); K O'Reilly, M Hynes, R O'Hagan; D Kelly, S Sheils; N Browne (0-2), K Conneely (0-3), D Dalton (0-5, 4f); M Sexton, M Carr (2-4), P Brady (1-3). Subs: S Harten (0-1) for M Hynes, S Sheridan for S Og Brady, A Mulcahy (1-0) for P Brady, F O'Reilly for D Dalton; B Nannery for K O'Reilly. Cootehill - A Hamilton; J Kelly, A Fitzpatrick, J McKitterick; N Clerkin, E Shalvey, J Fitzgerald; R Everett, F Hughes (0-2); C Carney (0-1), J Carney, D Carney (0-2); E Magee, C Farrell, M Moffett. Subs: C Wall for C Farrell, O McDonald for J McKitterick, C Shalvey for C Carney, M Hayes for A Fitzpatrick, G O'Rourke for R Everett.